Kundalini is the divine energy that lies in Dormant state in our body, and when awakened is felt as if a serpent is creeping on our spine. 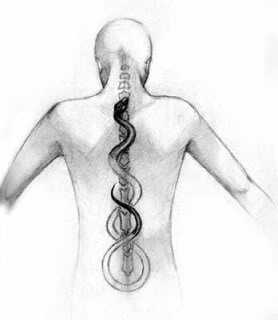 Due to this its also called "The Serpent Fire" The kundalini energy is felt as a strong gush of energy moving up in the spinal column which also called the Spinal Sweep. It is no new science, it is age old with its roots found in the Hatha Yoga Pradipika dated back to 15th Century. The Serpent is awakened and it rushes to forcefully open the Muladhara chakra or Root Chakra lying at the base of the spine, this is felt as if a electrical current is forcing near tailbone area. And as it bursts open pressure is felt rustling upwards the spine. This may result into body vibrating, but body will stabilise as soon as the negative energies in our body/toxins are released. And the chakras will be opened. Remember balancing the chakras be reiki or any chakra healing does not open them. 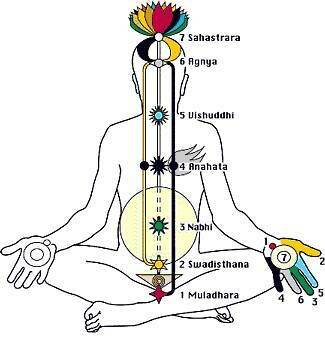 Only Kundalini passing the spine will open your chakras. 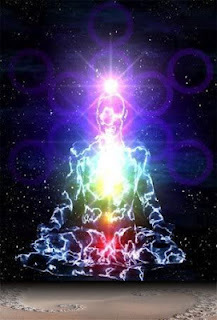 A body in which the Kundalini Energy regularly awakens is like an ever pure stream of energy. People will love your company as your aura is very positive. And the journey keeps going higher and higher as you keep practising your kriyas.... there is no limit to this. New powers, abilities and energy levels are felt with regular practise. Due to this no person achieves a certain level and stops and says "I have mastered it" everybody is always a student for the Mighty Kundalini Shakti. Even today after my 6years of being Kundalini activated I am still a student of hers. And am blessed by my Guru to offer this beautiful Divine Shaktipat at such a small age. So why would you need to awaken this energy? This energy is called the true potential of any human being. If you are an artist your skills would be doubled/tripled after the activation. It just does not apply for our skills but also for our weaknesses, if your certain chakra is weak resulting into poor performance of the chakra then the kundalini will balance out this chakra and make you 100% complete in yourself. Resulting that you will operate fully all the time everywhere. Is this energy something different from me? Means is this some external energy applying to my energies? No not at all, it is your own energy that was lying asleep which will be awakened by the shaktipat energy and when awakened it makes you a lot more sturdy and powerful in all your undertakings. What happens during a Shaktipat? A Shaktipat is a transference of a little energy from the master to his students' energy field, which helps the dormant energy of the student to get awakened. And the master takes away their energy after the shaktipat. This process has the pure Kundalini energy which is attached and the divine energy always treats us with utter care. So what should I do if I want to appear for the Distant Shaktipat event? The shaktipat events are organised regularly by me, the main requirement is to keep following the "Happy Rules" they are a key to Awakening your Kundalini energy Happily. Also send your photograph where your eyes are clearly visible. And the Payment amount Rs. 1500/- INR. Who can appear for the Shaktipat event? Anyone from the age of 12 till 80yrs. Also elder then that. A normal healthy person can also appear also unhealthy person can. Anybody who willingly wants to participate in this event is welcome. I advise Heart patients who have already undergone some kind of replacement not to take part here. Or any other kind of surgery where fake organs may be implanted in the body. Normal organ transplanted is ok.
What does Happy Rules mean? Happy rules are rules that will keep you happy all the while when your kundalini is being awakened, and your body goes under cleansing process. This process usually releases out lot of toxins and blocked emotions which surface up. As a result you may feel anger if you have suppressed it. Or sadness if you have supressed it. Following the happy rules will help you to release these pent up emotions quickly, and without feeling their pain. The Introductory fees is Rs. 1500/- INR or $30 USD or £20 GBP. This amount will be doubled once a few batches are completed. The rates are charged for the resources that make me run my work, and not for the shaktipat energy. The shaktipat is invaluable and can never be charged for. Living in this world is never for free and we always have to pay for food, phone bills, electricity etc to survive and so none of the services are given for free. What will you get for this amount of Rs. 1500/- ? You will receive Shaktipat (Energy) that will help you to awaken your kundalini for full 7 days all 24 hours. Also you will receive a Guide book for you to follow during the 7 days. Which will help you to make full use of the Kundalini Shaktipat. Also 7 days full support from me for 12hrs. From 9am IST till 9pm IST. Special arrangements are made for ease of non-indian residents too. Why is Kundalini been given so much of Importance rather then any other Healing or other self-help process? Kundalini once awakened will help you guide your life. It is the master of your mind, body and soul and will help you in every areas of your life. Every time a kundalini spinal sweep happens your chakras will get balanced automatically, your aura will be healed and your physical body will be a little more healthier then before. These are the basic advantages, the spiritual heights you reach and new ideas you learn on a daily basis are the bigger deal. And this doesn't stop, this process goes on and on everytime you get a spinal sweep. This saves you all the money of a healing+ Chakra Balancing+ Aura Cleansing which all sum up and price more then the actual price of this Shaktipat. So if this energy is so powerful then why am I offering my event at such cheap rates? Whereas other Kundalini Teachers charge 20 times more then this fees? Its cheap because Im a new teacher, and as I start something new; new ideas and additions will keep on coming for this Shaktipat event. And in this process I too will continue learning. The day I feel enough additions are done and event can be charged for more money I would increase its price. Again the price would be of the resources that will help me put up the improved Shaktipat event. And not for the Divine Shakti. How many times can you repeat the Shaktipat event? Also after 10 repetitions, you will have to pay for the full amount. As usually no one needs this many repetitions. Why to Repeat the Shaktipat? The Kundalini Awakens with just one shaktipat, but there are several blocks that are accumulated in our mind and soul since last many decades and many past lives; which become very rigid and only kundalini can easily unlock them. In case more blocks are there, Shaktipat energy can help you to get deeper and profound stated of Meditations during which these blocks will be easily released permanently. NEXT KUNDALINI SHAKTIPAT EVENT IS HAPPENING ON 2nd- 8th Sept 2012. TO CHECK WHETHER YOU ARE ELIGIBLE FOR IT, SEND ME YOUR PIC WITH CLEAR EYES. TO powerbooster@facebook.com ALSO IF YOU ARE SELECTED YOU WILL HAVE TO REGISTER YOUR NAMES WITH A SMALL TOKEN AMOUNT OR FULL FEES BEFORE THE EVENT. And in-person Shaktipat will guaranteed-ly awaken even in the first Shaktipat. Go to How to Join? page to learn more... you can then fill up the participation form if you are really interested in joining this event. *Prices are prone to change and they will be reflected on this page. Please keep checking for details. ** The policy for repetition is for limited repetitions as within few repetitions you may master this energy. ***This is not an alternative to your medical prescription. At time of need do what your Practioner says.